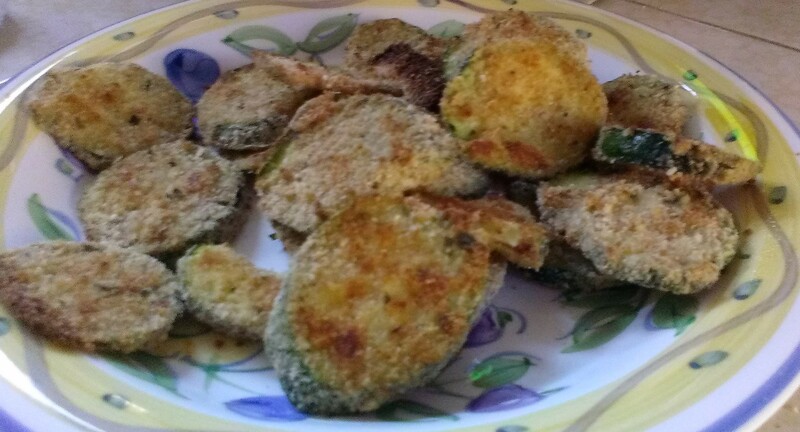 Fried zucchini is one of my favorite snacks. I love them even more than french fries. For awhile, I even convinced myself that they were healthier because they were zucchini. Right? But in reality, there’s just not that much difference in fat or calories between the two. Preheat oven to 425F. Combine breadcrumbs, cheese, onion and garlic powder on a small plate. Beat egg and milk together on another plate. Coat a cookie sheet with cooking spray. Dip each zucchini slice into the milk mixture, then dredge in the breadcrumb mixture. Place about a half inch apart on cookie sheet. Bake for 20 minutes, flip coins over and bake for an additional 20 minutes or until golden brown.